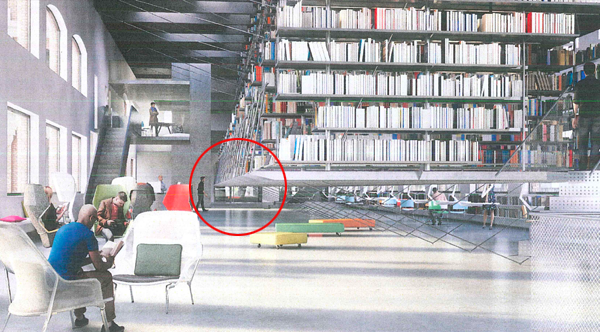 Although the mezzanines proposed for the Fine Arts Library in Rand Hall at Cornell are noncompliant because too many floors are interconnected, it turns out that they would be noncompliant even if only two floors were interconnected. This is because they are too big. Instead of measuring the actual areas of rooms and spaces, the architects of the Fine Arts Library 100% schematic design proposal have invented a new area category which they call “useful area.” This “useful area” omits what the architects call “circulation area” from the actual net areas of rooms and spaces, so these areas do indeed become quite useful: useful, that is, for fudging the actual numbers so that the mezzanines appear to be compliant. For example, the net areas of Mezzanine 3.1 and Level 3 are 1,989 and 3,883 square feet respectively, according to data in the architect’s proposal. However, for a floor area of 3,883 square feet, the maximum allowable gross area of the mezzanine would be 3,883/2 = 1,942 square feet. Why use gross area instead of net or “useful” area? Because that’s what the Commentary to the IBC (which is the model Code from which the NYS Building Code is derived) says should be used. But even the net area of this mezzanine would be too big. The second-floor mezzanine is just as bad. The architects claim that the “useful” area serving as the basis for the second-floor mezzanine area calculation is 7,610 square feet which, when the circulation area is added to it, creates a net area of 8,539 square feet. This number appears to include every room on the second floor, including the bathrooms. Clearly, the second-floor mezzanine is not “in” the bathroom space, and so this area must be excluded. Instead, let’s assume a more reasonable area of 8,000 square feet for the second floor. The maximum allowable mezzanine area would therefore be 4,000 square feet. However the net area listed for this mezzanine level is 4,589 square feet — far too big for the room or space it is in. By hanging the stack levels above the second floor, two additional problems are created, or only one problem if you believe that creating a four-foot-high dust-collecting space under the entire second-floor stack level — just so the stacks will appear to be hanging from above — is not a problem. What remains a problem is that this geometry creates what the NYS Building Code or the ADA calls a “protruding object” — that is, a surface with a leading edge that is high enough above the floor (more than 27 inches) so that it presents a danger to anyone with a vision disability, even those using canes. The entire second-floor stack level, hovering about four feet above the rest of the second floor, creates one huge protruding object. This entry was posted in Architecture, Milstein-Rand-Sibley Hall on May 13, 2015 by jonochshorn.